There are umpteen number of reasons why we all are running our respective blogs. It could be for a creative outlet for one’s talent or to creatively utilise excess time on hands. 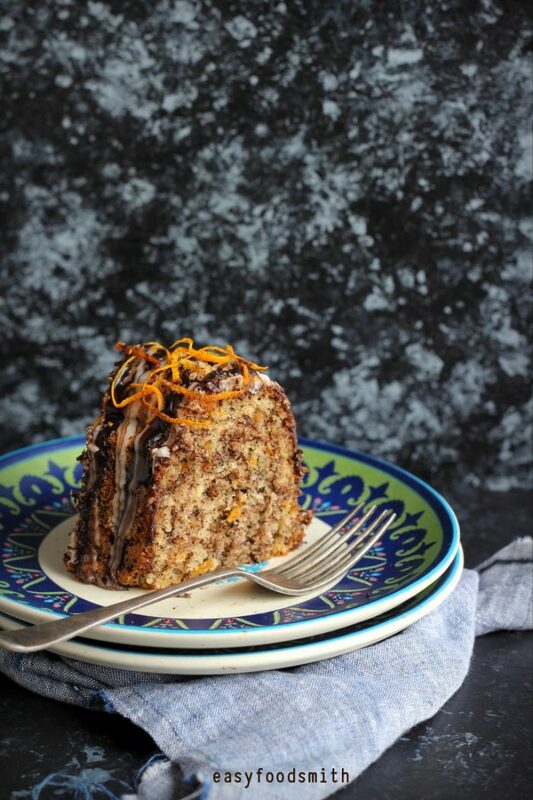 Certain others blog to showcase their cooking and photography skills while for some it is about assembling family recipes and their various successful experiments in the kitchen at one place which is accessible to their family and friends. Whatever the reasons may be, one common thread that binds each one is – sharing. It is all about sharing one’s precious/ favorite recipes and skills with a larger base of people. And that is what the food blogging community is all about. It is a wonderful community where everyone supports, cheers and encourages each other besides motivating and inspiring. I had never been very regular with my Instagram account earlier but at the behest of a blogger friend, I started posting on a regular basis. And I am so glad that I begun doing that coz I came across some wonderful bloggers and made some amazing friends. It is always nice to know the faces behind the blogs and even more so about what makes them tick. One such blogger that I came across is Kamini and when she asked me if I would be interested in doing a guest post for her, I was more than happy to oblige. Kamini is a passionate cook/ baker and runs a vegetarian blog by the name Kitchen Therapy (do check out her blog and her delicious recipes). Besides being a Communications Consultant for corporates, this beautiful lady has authored a book – The Morning After. She is a regular contributor to Indian’s largest selling national publication ‘The Times of India’ and its various publications. It is an absolute pleasure being a part of your ‘In your Kitchen’ series, Kamini.  You can follow her here – Instagram, Facebook, Pinterest, Twitter and Youtube. 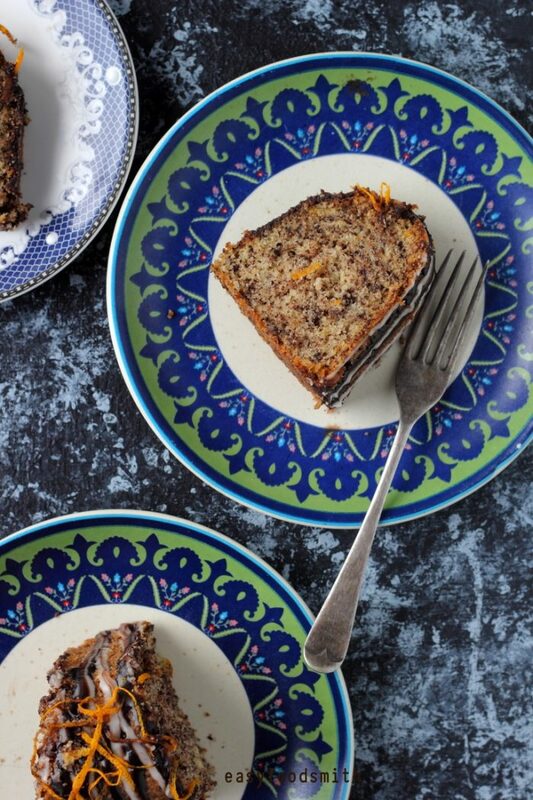 The cake I am sharing is a family favorite; one, that my daughter never seems to get enough of! Do try it in your kitchen and I promise you, it will surely delight you. The only advice I would give here is, use good quality chocolate for this cake. Grate the chocolate and set aside (I learnt this trick of grating the chocolate from a local baker) I grate the chocolate the night or at least a few hours before I intend to make the cake and keep it refrigerated till ready to use. Rub in the orange zest to the caster sugar, using your hands, and set aside. 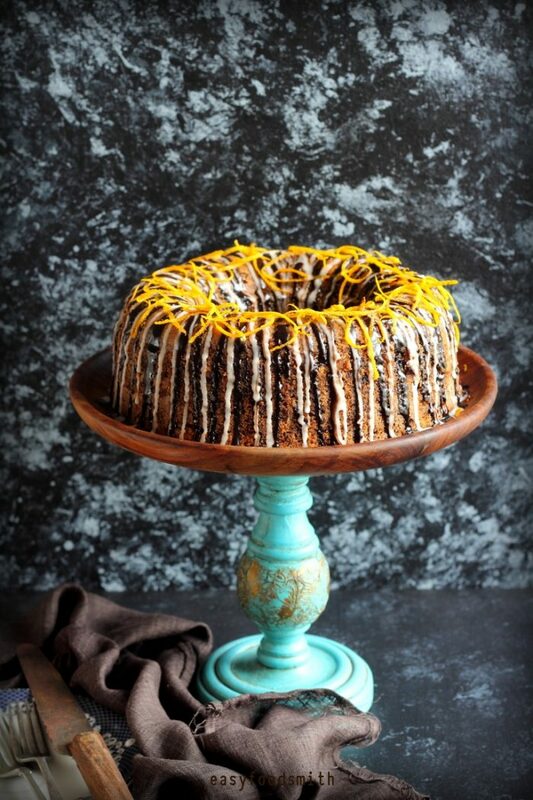 Prepare a 9 inch bundt pan by greasing it with butter or oil and dusting it with flour. Remove excess flour and set the pan aside. Sift together the all purpose flour, cornflour, baking powder and baking soda at least five times. Set aside. Add sugar and whisk for another two to three minutes, scrapping the sides occasionally. Add the eggs, one at a time and beat on medium speed until smooth. Scrap the sides of the bowl with each addition. Add the vanilla essence and yogurt along with half the flour and fold it in till it just gets incorporated. Add the rest of the flour and mix it in. Do not over whisk or over mix the batter. You just need to incorporate it. Gently fold in the grated chocolate and transfer the contents to the prepared bundt pan. Smoothen the top of the batter using a spatula or back of a spoon and then gently tap the pan on the counter top to remove any air pockets. Transfer the pan to the pre-heated oven. Bake for approximately forty minutes or till a skewer inserted comes out clean. Remove the pan from the oven and allow the cake to sit in the pan for 10 minutes. Run a knife gently around the edges of the pan and turn over the cake on to a wire rack. Cool completely before adding glaze. Whisk together the juice and the sugar (adjust consistency to your liking) and drizzle over the cooled cake. Scrap the chocolate with a knife and heat it over a double boiler along with milk and butter. Do not stir. Once the chocolate has melted, remove it from heat and whisk it well. Allow it to cool before pouring it over the cake. Slice and serve the cake. Enjoy! Note – Do not open the oven door for the first 10 – 15 minutes. Note – Every oven has its own setting of the thermostat. I advice you adjust the temperature according to the thermostat of your oven. Note: Feel free to add nuts of your choice to the batter if you wish to. Such a pretty cake with beautiful shots! 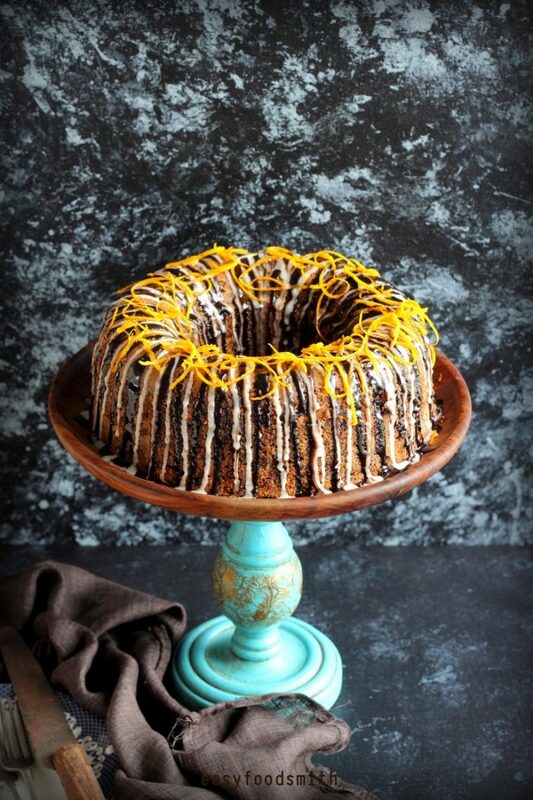 Love everything about this chocolate and orange cake, so pretty too! I enjoy the sharing and the community blogging and instagram as well. Wonderful words, blogging is indeed a world of its own and food bloggers are the best :). You made such a wonderful creative cake my dear, looks amazing. I am just starting to be meaningful in instagram would love to follow you. I bet the flavors are blasting! 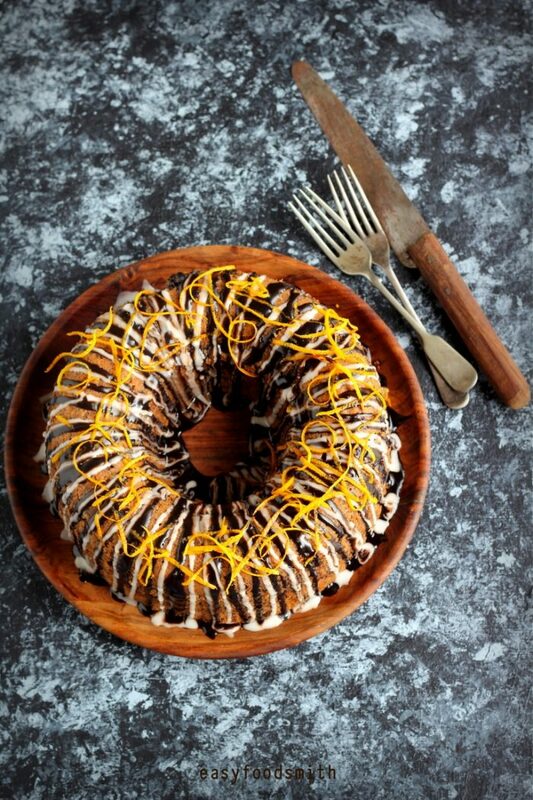 Love the combo of chocolate and orange. This sounds SO GOOD! On my way to check out the recipe right now . 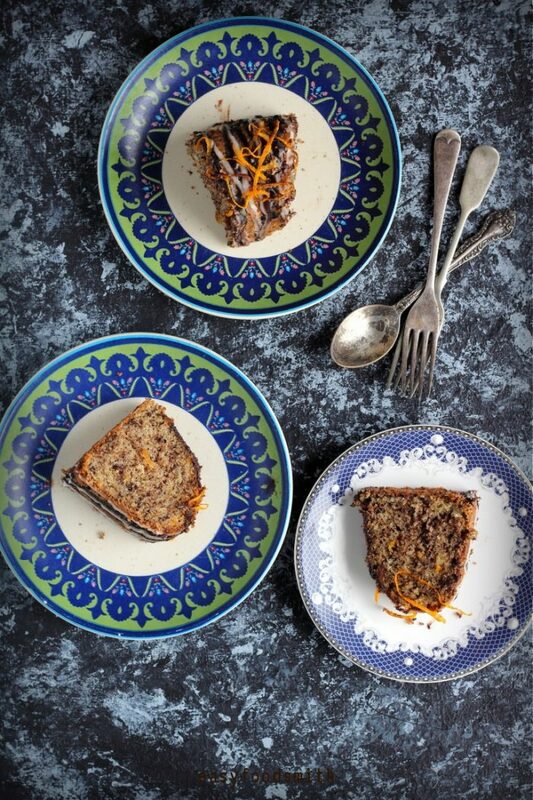 . .
Lovely combo of chocolate and orange…Beautiful cake!